Ephemera, wrappings and the detritus of everyday life have always been of interest to artists, as a symbolic obverse of the usually beautiful objects found in still life paintings. Velasquez and Chardin both elevated common household articles – pottery pans, rush baskets, linen, brass and wooden implements – to equality with silver, porcelain and silk brocade; and modern throwaway items are as much the subjects of still life paintings as their grander cousins. Stephen Rose (q.v), for instance, manages to heroicize the clear supermarket plastic bag and the rigid plastic container into artifacts of transcendant beauty; and here Weissbort replaces the mussel, shrimp and oyster shells found in a Hubert de Bellis (q.v. ), and the glass bottle or decanter, china cup, napkin and empty plate (see E.P. 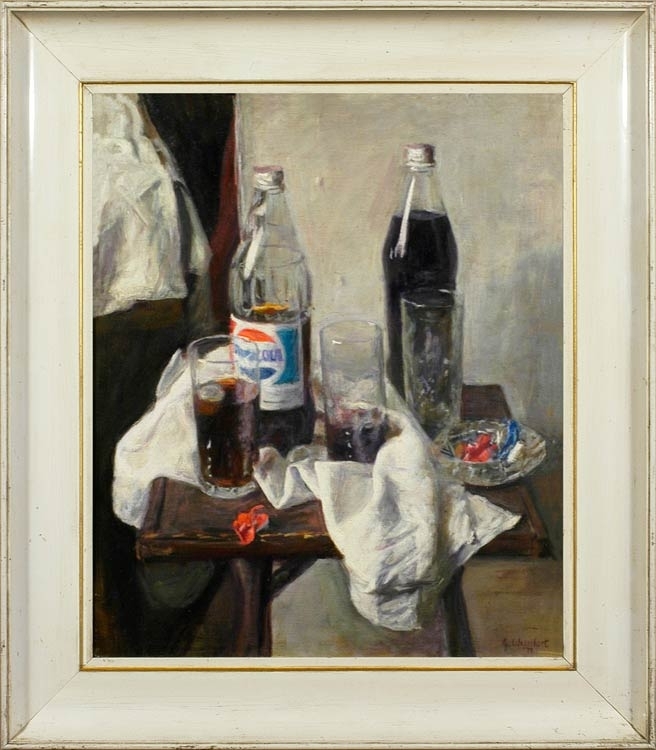 Berne Bellecour, The remains of the meal, 1876, Chrysler Museum of Art) with plastic Pepsi bottles, cheap glasses and an ashtray of dogends. Undercutting the relentlessly downbeat air of these objects are the colour harmonies of the composition, in which shades of pearl grey, dark cool browns and touches of soft blues and reds echo and re-echo across the painted surface.